The Great Depression hit Manhattan with a cruel blow. Once-comfortable businessmen now stood in soup lines. Families lived in shanty towns in homes made of packing crates on the far East Side. Businesses failed. And Mr. and Mrs. William Goadby Loew built a new mansion. Loew descended from the old and esteemed Goadby family of Manhattan and was, for city directory purposes, a stock broker. He ran his own firm at 2 Wall Street that handled the brokerage business of “the Baker interests” – his deceased father-in-law’s money -- although he was often asked on the Exchange floor why he worked at all. 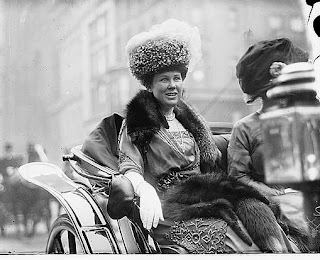 Florence Loew, whom friends called “Queenie,” had inherited approximately $5 million of her own from her fabulously wealthy father. When the Depression hit, the Loews lived on Madison Avenue in the 30s. They also owned an estate in Old Westbury and a mansion in Newport where, as Time Magazine pointed out, “Mrs. Loew raises prize narcissi.” William Loew was a member of no fewer than a dozen clubs in the city. The couple was managing just fine. 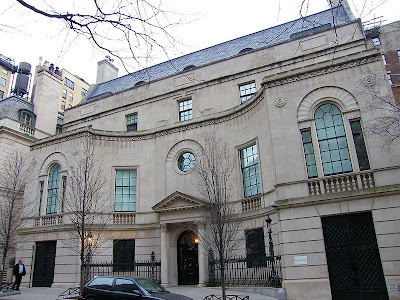 Walker & Gillette produced an English Regency estate modified to slip among the sleek lines of Manhattan Art Deco fashion. The smooth masonry façade, sitting on a rusticated base, is more elegant than ornate. Its three stories center on a concave entrance wall, creating a shallow forecourt. Classical balustrades support the second floor windows and simulated stone linen folds cap the Palladian-style side windows and bulls eye window over the classic entrance portico. The house was completed in 1932 and buzzed with fashionable dinners and cocktail parties. The Loews lived happily here with their sixteen servants for only four years before Florence Loew died in May of 1936. William Goadby Loew stayed on at 56 East 93rd Street until his death in 1955. The magnificent house was opened to the public for three days in April of the following year to display what The New York Times called a “treasure of English furnishings” before they were put on auction. Over 2000 people braved the rain to tour the 40-room home where the Loews’ collection of antiques and priceless artwork was displayed. One of William Loew’s paintings, by Joshua Reynolds, sold for $12,000. One of the most impressive and architecturally singular homes in Manhattan, it caught the eye of Broadway impresario Billy Rose – still remembered for his Aquacades at the 1939-40 New York World's Fair. Rose purchased the property for approximately $550,000 with grand ideas. As it turned out, Baldwin refused the commission; however Billy Rose filled the Loew estate with remarkable works of art and furniture and lived there until his death in 1966. When St. Luke’s Hospital took over the mansion for its Smithers Alcoholism Center, William and Florence Loew’s remarkable interiors were removed. From Jacobean paneling to Art Deco fireplaces, the rooms were stripped to clinical practicality. In 1999, however, the Spence School, a private girls school, acquired the property. The school hired architect Samuel White to convert the structure for school use. Astoundingly, White found the original interiors in storage, ready to be reinstalled. Thomas Goadby of 21 West 35th St was William Goadby Lowe's grandfather. Julia Frances Goadby, Thomas' daughter by his first marriage to Julia A. Stacey, married Edward Victor Loew in 1872. Any Connection The Godbys/ GODBEYS of Missouri U.S.A Thomas Godby was my was about my 7th grandfather .